As far as I am aware, no films from Chinese women are available on DVD in the UK (it would be great to be proved wrong!). The two films that we may be able to see an extract from are both Hong Kong imports from Yes Asia. The service is good and the DVDs are not expensive. These two films are on good quality DVDs, but they can vary. The experienced director Ann Hui (born 1947) is a key figure in Hong Kong Cinema. Born to a Chinese father and Japanese mother in Manchuria, she moved to Macao and then Hong Kong as a child and later spent two years at the London International Film School. She began work in Hong Kong television and then became part of the Hong Kong New Wave Cinema making prize-winning films such as Boat People (1982) one of a trilogy of ‘Vietnam films’. More recently she has directed and acted in films with more of a populist feel. Jade Goddess of Mercy (2003) is an interesting film adapted from a popular novel. The young Chinese filmstar and pop star Vicki Zhou (Wei Zhao) plays a young policewoman working on a drug squad and juggling the job, a baby and a marriage under strain. Mabel Cheung (born 1950) has had a similar career structure. She was born in Guangdong, Southern China, moved to Hong Kong, studied drama in the UK and joined Hong Kong television. After film school in New York, she began directing features in 1985. 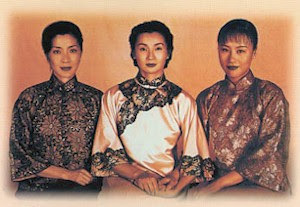 Her 1997 film The Soong Sisters is a biopic of the three sisters who each married one of the leaders of the Chinese Republic in the early 20th Century (one married Sun Yat-Sen, one a banker and Finance Minister and one Chiang Kai-Shek) and who played an important role in Chinese public life up until the 1980s. The film also celebrated the best acting talents in Hong Kong Cinema with Maggie Cheung and Michelle Yeoh playing alongside Vivian Wu (better known in American films and television). There are several other Chinese women directors currently active and some of them are referenced on this website describing an event at the Hong Kong International Film Festival. Earlier this year, as part of the China 07 Festival, Cecile Tang (Shu Shuen Tong)’s 1970 film The Arch was screened at the National Media Museum and we blogged a report on our sister blog. This entry was posted in Chinese Cinema, Directors, Films by women. Bookmark the permalink.